For writing Android applications (apps) you need the right software. Google provides free access to their preferred app development software for use in Microsoft Windows, on Apple Macs and for Linux PCs. 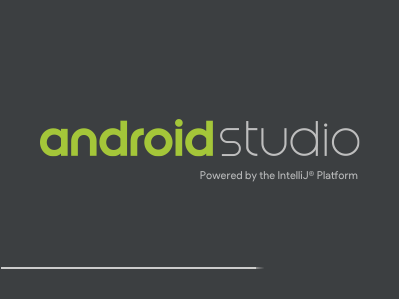 It is called Android Studio, download Studio from the Android Developer website. An app is a computer program and like all programs it needs designing, writing, compiling, testing and debugging. This is all done in an Integrated Development Environment (IDE). There are many IDEs from which to choose. 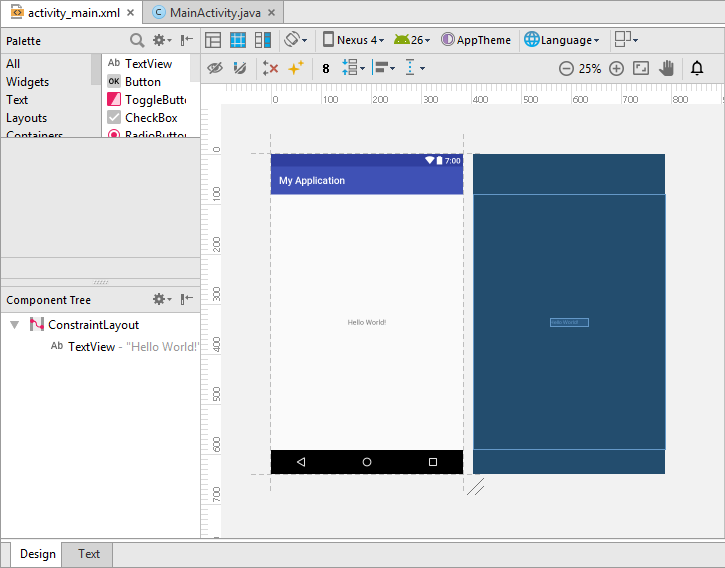 This article deals with the IDE provided by Google, called Android Studio. 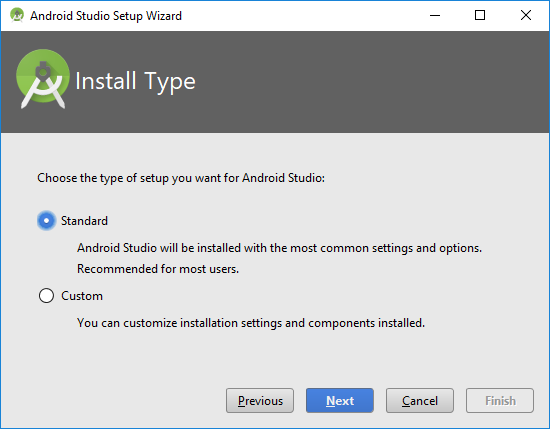 The easiest way to setup Android Studio on Windows is to download the Android Studio Windows installer. Alternatively Google provides a zip file that can be used for setting up Studio. Either of these downloads are a gigabyte (GB) in size, and install or expand to 1.6GB. Android Studio then downloads another 2GBs of files to complete the setup! Therefore, make sure you have a decent Internet connection, and plenty of disk space. Read on for information on installing and running Android Studio using the zip file. Note: Developing Android apps on a PC is resource heavy. The PC will struggle if it does not have a recent processor, i3 or better, and enough memory, 4 GB or better. Experience has shown that a recent i5, i7, Ryzen or i9 processor is best, and 6 GB should be regarded as the minimum memory to have free. Apps are written in a computer language. The widely used Java is the big language for Android. Java needs to be installed on Windows PC, see below, before Android Studio can be installed. There are other languages available for writing Apps, and Google supports C and C++ with the Native Development Kit (NDK). Google is also pushing Kotlin as a language for App development. The NDK and Kotlin also use the Android Studio IDE. Android Studio requires the Java Development Kit (JDK). This needs to be installed from the Java Standard Edition (SE) Downloads page. Only download Java from the official JDK website. For more information on getting Java on Windows see the article Installing Java on Windows (32-Bit or 64 Bit). On the Studio download page at Android Developer website click on the Download Options link or scroll down to the Android Studio downloads section. There is a link provided for both the 64-bit and 32-bit versions of Studio. To use the 64-bit version you need to be running a 64-bit version of Windows. 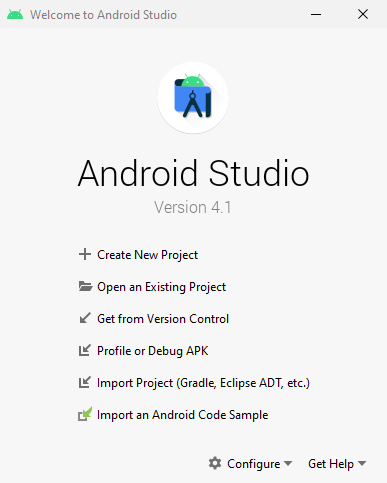 Download the Android Studio IDE zip file required (accepting the terms and conditions). Note: You may have issues clicking the link in some browsers (e.g. Microsoft Edge), if so use the context menu (normally right-click) and select Save as to download the zip file. Once the Studio zip file download is complete use Windows File Explorer to copy the android-studio folder inside the zip file to the required location. E.g. to your Users folder or the root of a disk drive. Because Android Studio is often updated I would not recommend copying it to the Programs folder. In the bin directory under android-studio are the Studio executables. For a 64-bit installation studio64.exe is used, otherwise studio.exe. It is worth setting up a shortcut to the required exe on the Desktop or the Taskbar. The first run will complete the setup of Studio. If running Windows as a standard user, then for the first run it is recommended to run Studio as an administrator. Use the context menu on the exe and select Run as administrator, you will need to enter the Windows machine administrator password. Run Studio, it can take a good few seconds to get going, and a setup wizard will be shown. If you want to change the default options select Custom. Go through the wizard with the Next button. 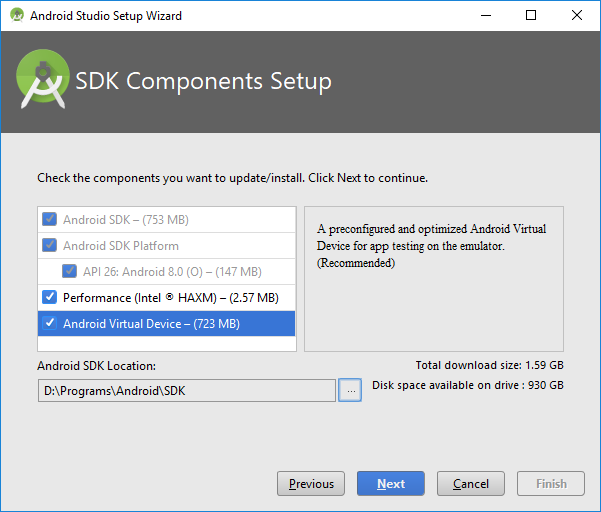 One tip is to change the location of the Android SDK in the setup wizard. By default it is buried under the AppData folder. An easier to find location is recommended, on a disk with lots of free space. Here it has been set to D:\Programs\Android\SDK. For testing and debugging apps a real device or virtual device can be used. The wizard allows a virtual Android device to be installed. The Intel HAXM utility is useful (probably a must) for improved performance when running an Android Virtual Device (AVD). If the setup does not complete the HAXM utility may not have installed. You may need to use Task Manager (via Ctrl-Alt-Del or typing Task Manager in Windows search) to stop Studio. Then go to the Android SDK location and find intelhaxm-android.exe under the Intel directory in the extras folder. Run the exe, you may be required to enter the Windows administrator password. 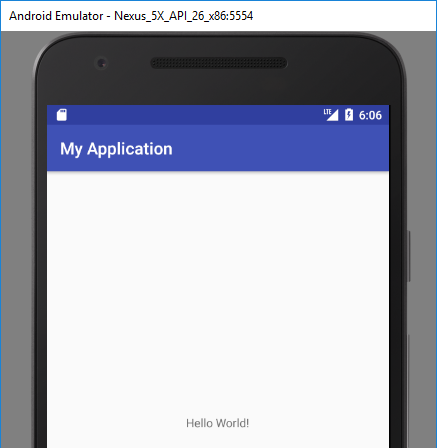 Test out Android Studio by starting a new project, maybe a simple Hello World app. It can take some for Studio to open for the first time. So be patient. Likewise for the first app to compile. When the Studio IDE loads use the status bar at the bottom to view progress messages. Use the play button on the tool bar to run the app code. Select the deployment target. If an Android device is not install select the Create New Virtual Device option to create an AVD. Download one of the existing x86 images for best performance on a x86 based Windows machine. When the AVD loads it may show a black screen. If so changing the AVD options for the OpenGL settings and powering the AVD off and on again may fix it. To test on a physical Android device install the manufacturers driver. With the driver installed use a USB cable to connect the device to your PC. You will need to enable USB debugging on the device. Once the AVD starts the app will be loaded onto it, and the App will run. 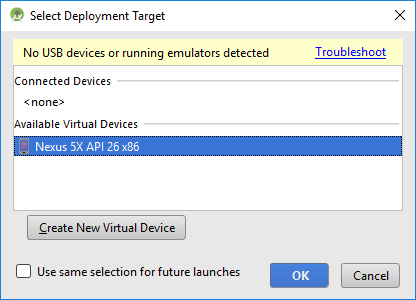 Use the SDK Manager from the tool bar to keep the Android SDK up to date and download additional libraries and packages.